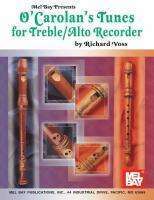 Der Artikel Richard Voss: O'Carolan's Tunes for Treble/Alto Recorder wurde in den Warenkorb gelegt. Ihr Warenkorb enthält nun 1 Artikel im Wert von EUR 11,10. Turlough O'Carolan was born in County Meath, Ireland in 1670. He was trained as a youth to play the harp, and throughout his life composed a large number of songs. O'Carolan developed a personal style, containing melodic elements of Irish folk music, courtly harp music and Italian baroque music. O'Carolan's music was not published during his lifetime; therefore, various versions of his melodies have been handed down through the aural tradition. It is also not known how he accompanied his melodies. This collection presents 39 favorite O'Carolan melodies in easily playable, lively arrangements for alto (treble) recorder, with guitar chords above the staves. Included are four original melodies by Richard Voss inspired by and in the style of the early master.